Human toxocariasis is a widespread, zoonotic, parasitic disease caused by the presence of larvae from Toxocara canis or Toxocara cati in human tissues. Toxocara spp infections are highly pleomorphic, depending on the number and location of encysted larvae in the body and the immune sensitivity of the host. Practising family physicians need to keep in mind that Toxocara spp infection can generate unusual manifestations such as vasculitis or chronic skin disorders. Association between rheumatoid purpura and toxocariasis is rare,1,2 and the involved mechanisms remain poorly understood. After a 3-week history of fever and influenza syndrome, a 28-year-old woman was admitted to the Department of Nephrology for acute abdominal cramps and palpable purpuric rash all over her legs and abdomen, associated with inflammatory arthralgia affecting her knees and her wrists. Laboratory test results were positive for persistent presence of proteins in her urine (more than 2 g per day) and a high level of mobile immunoglobulin G complexes. A renal biopsy was carried out and showed a proliferative diffuse glomerulonephritis, compatible with the diagnosis of rheumatoid purpura. Results of other immunologic investigations, including complement fractions exploration, rheumatoid factor dosage, and cryoglobulins detection, were negative. Serologic test results for hepatitis B and C, HIV, and antistreptolysin O were negative. In contrast, the Toxocara serologic test results were strongly positive by both Toxocara enzyme-linked immunosorbent assay and Western blot (WB) analysis. An anthelmintic treatment with diethylcarbamazine was thus added to the corticosteroid therapy and the symptoms rapidly resolved. During the next year, the corticoid doses were progressively diminished and the patient remained well, with normal renal function and no recurrence of the disease. Because human toxocariasis is a parasitologic dead end, neither adult roundworms nor eggs can be found in stools to make a direct diagnosis. Moreover, larvae are very rarely found in skin biopsies, and the procedure is too invasive for the severity of the disease. Consequently, the diagnosis is only indirect and 2 types of tests are available for the immunodiagnosis of toxocariasis: the enzyme-linked immunosorbent assay and the WB, both using T canis excretory-secretory antigens. 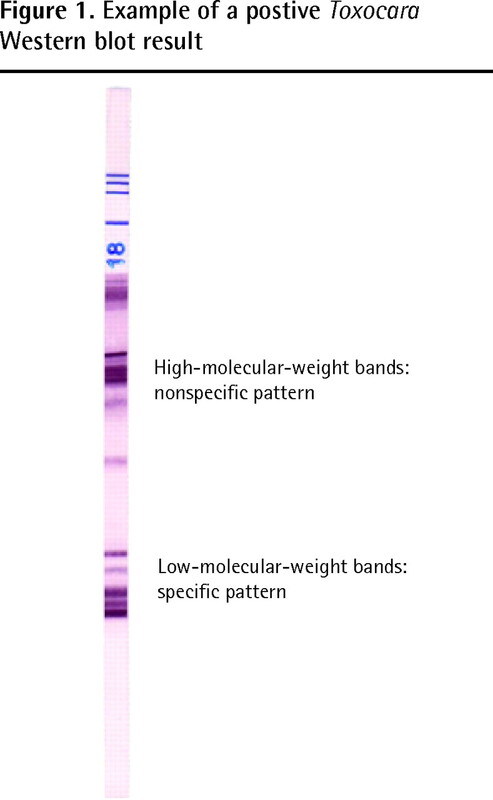 Western blot is the more sensitive and specific of the 2 assays.8 The high specificity of the test is based on the distinction between the cluster of higher-molecular-weight bands, which is not specific and is suggestive of cross reactions with other helminthiasis, and the cluster of lower-molecular-weight bands, which shows a high level of specificity. Figure 1 shows an example of a positive WB result. The source of contamination is not always easy to identify. For example, in the case presented here the patient was not a cat or dog owner, but she was living in a rural area and reported frequent contacts with soil (gardening), which might have favoured exposure to Toxocara spp. In all cases, prophylactic measures must be taken; they can prevent reinfection and must be explained carefully to patients. For example, dogs and cats must be treated by veterinarians; risk behaviour such as poor personal hygiene must be avoided; and dogs must be banned from public playgrounds in order to prevent infection of children from contaminated sand or geophagia. Vasculitis and chronic skin disorders can be the only suggestive signs of an underlying Toxocara spp infection. Toxocaral investigations should be undertaken especially, but not exclusively, in the presence of an evocative clinical spectrum, blood hypereosinophilia, increased total immunoglobulin E, or risk factors for infection by the parasite (eg, frequent contact with pets [dogs and cats] or with soil [gardening]). We believe Toxocara spp infestation should be investigated more systematically when examining patients presenting with vasculitis or chronic skin disorders. This could improve our knowledge about the contribution of anthelmintic treatment and also about the frequency of these associations, which are probably underestimated. Associations between toxocariasis and vasculitis manifestations are unusual and are probably underestimated; management remains unclear. The source of Toxocara spp contamination is not always easy to identify. In all cases, prophylactic measures must be taken: dogs and cats must be treated by veterinarians; risk behaviour such as poor personal hygiene must be avoided; and dogs must be banned from public playgrounds in order to prevent infection of children from contaminated sand or geophagia. Toxocara spp infestation should be investigated more systematically when examining patients presenting with vasculitis or chronic skin disorders. This could improve our knowledge about the contribution of anthelmintic treatment and also about the frequency of these associations. Les associations entre la toxocarose et les manifestations de vascularite sont inhabituelles et leur nombre est probablement sous-estimé; la prise en charge demeure incertaine. Il n’est pas toujours facile d’identifier la source d’une contamination au Toxocara spp. Dans tous les cas, il faut prendre des mesures prophylactiques: les chiens et les chats doivent être traités par un vétérinaire; les comportements à risque comme une mauvaise hygiène personnelle doivent être évités; et il faut bannir les chiens des terrains de jeux publics pour prévenir l’infection des enfants par le sable contaminé ou la géophagie. Il faudrait rechercher plus systématiquement une infestation par Toxocara spp quand on examine des patients présentant une vascularite ou des problèmes chroniques de peau. Nous pourrions ainsi améliorer nos connaissances concernant la contribution d’un traitement anthelminthique et la fréquence de ces associations.
. Henoch-Schönlein purpura associated with Toxocara canis infection. J Rheumatol 1999;26(2):443-5.
. Henoch-Schönlein purpura and toxocariasis [article in Polish]. Pol Merkuriusz Lek 1998;4:217-8.
. Henoch-Schönlein purpura associated with Toxocara canis infection. J Rheumatol 2000;27(3):818-9.
. Systemic vasculitis with lymphocytic temporal arteritis and Toxocara canis infection. Arch Intern Med 2002;162(13):1521-4.
. Toxocariasis and cutaneous vasculitis [article in French]. Rev Med Interne 2004;25(12):940-3.
. Cutaneous manifestations of human toxocariasis. J Am Acad Dermatol 2008;59(6):1031-42. Epub 2008 Sep 14.
. Comparative assessment of enzyme-linked immunosorbent assay and Western blot for the diagnosis of toxocariasis in patients with skin disorders. Br J Dermatol 2010;162(1):80-2. Epub 2009 Jul 20.
. Application of the western blotting procedure for the immunodiagnosis of human toxocariasis. Parasitol Res 1991;77(8):697-702.